This Saturday, January 24, from 12-4pm, don't miss the inaugural BrewShine Fest at The Deck at Moonshine Flats, located at 335 Sixth Avenue in downtown San Diego. The Deck is bringing great craft beer together with moonshine for an epic day­drinking event - one of the first of its kind! SanDiegoVille readers receive a $5 discount on tickets by using promo code SDVILLE at checkout! Tickets to the BrewShine Fest are $35 for GA passes and $50 for a ticket and a commemorative event t-shirt. Don't forget to input promo code SDVILLE to save $5 per pass. Tickets include 16 beer samples, 4 moonshine samples, a souvenir tasting mug, as well as live music, fun games and a cool open air vibe. It’s an intimate beer and moonshine festival with the luxuries of a bar and restaurant! 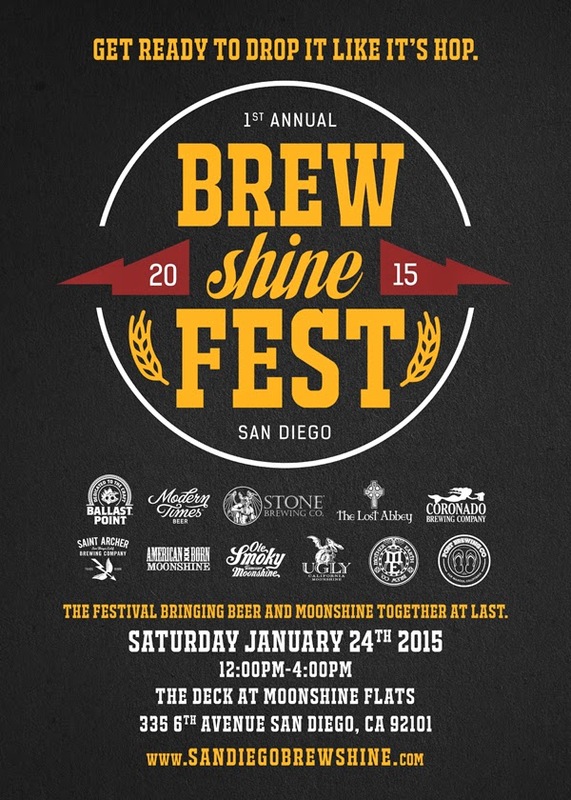 Participating breweries at the BrewShine Fest include San Diego favorites Stone Brewing Co., Modern Times Beer, Saint Archer Brewing Company, Ballast Point Brewing & Spirits, Coronado Brewing Company, Mother Earth Brew Co., Port Brewing and The Lost Abbey. Moonshine will be provided by Ballast Point Devil's Share, Ole Smoky Moonshine Distillery, American Born Moonshine, Kill Devil Spirit Co. and Ugly California Moonshine. Live music will be performed throughout the event by Quel Bordel and Moonshine Flats Resident DJ Famous Dave. The full Moonshine Flats food and bar menu will also be available during the event. For more information on the BrewShine Fest and to purchase tickets, visit sandiegobrewshine.com.